A shooting in Brighton Park killed Natalie Ramirez, 27, and wounded two others this weekend, officials said. BRIGHTON PARK — After the neighborhood's fourth gang murder in less than two months left a Bridgeport mother dead, community advocates are holding a candlelight vigil at City Hall on Tuesday to try to persuade Mayor Rahm Emanuel to spend money on violence prevention programs on the South Side. Over the last three weeks, shootings killed or wounded 20 people in Brighton Park, Back of the Yards and Gage Park, according to Chicago Police. Recent bloodshed should be enough to push Chicago bosses to spend the $17 million surplus from the city’s property tax rebate effort on resources to prevent more murder in South Side neighborhoods, Brosnan said. Emanuel has proposed using about $6.1 million from the pot of leftover money on a variety of programs, including $1.8 million to equip every police officer with a body camera by the end of 2017 — a move praised by the U.S. Justice Department in its investigation into the Chicago Police Department. The mayor proposed using another $2 million to acquire and renovate vacant homes. The City Council approved $1.3 million from the tax rebate surplus to defend immigrants threatened with deportation under President Donald Trump. Meanwhile, South Side advocates said violence is mounting all over the city. From Jan. 1 through Sunday, there have been more slayings, shootings and people killed or wounded in shootings than during the same period in 2016 — a year that marked Chicago's bloodiest days since violence marred the city in the '90s. The violence has not slowed. In first 22 days of this year, detectives have opened at least 40 murder investigations. Recent victims include brothers Simmie and Simmieon McGruder and young mother Natalia Ramirez. There were about 35 people slain over the same time last year. Shootings are also slightly up. There were 174 shootings by this time last year, killing 36 people and wounding 186 others. This year's tally already includes 177 shootings — attacks that killed at least 37 people so far and wounded about 190. Neighborhood advocates say there’s a correlation between gang violence and a steady stripping of resources that has left the South Side without violence-prevention programs. Since Dec. 16, there have been four fatal gang shootings in this neighborhood, a place where about 37 percent of the population lives below the poverty line, about half the population older than 25 is without a high school diploma and half of residents between 20 and 24 are unemployed. Over the last decade, Brighton Park has become a battleground for street gangs like the Satan's Disciples, La Raza, 50 Strong and the Latin Saints. The last gang shooting killed Ramirez, a 27-year-old mother from Bridgeport. At 3:15 a.m. Saturday, Ramirez and two other victims were in the 3800 block of South St. Louis Avenue when a dark car pulled up next to them and a man got out and fired shots, police said. A 28-year-old man was shot in his leg and a 22-year-old man was shot in his back. They were taken to Mount Sinai Hospital, where their conditions were not available, but they were listed as "stable," police said. The woman was shot in her head and taken to Mount Sinai Hospital in critical condition, police said. Ramirez, of the 3000 block of South Princeton Avenue, was pronounced dead at 4:02 a.m. Sunday, according to the Cook County Medical Examiner's Office. 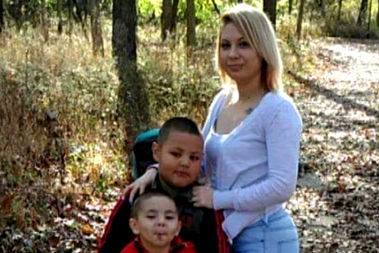 Ramirez had two young sons, friends wrote on Facebook. A GoFundMe campaign for her family raised more than $5,500 in just one day. "Thank you for all you ever did for me and for always making me smile when I was down," one woman wrote of Ramirez on Facebook. "Your laugh was contagious. You are an angel in Heaven now watching over your babies." No one is in custody in the slaying. Ald. George Cardenas (12th) said the area of Brighton Park in this ward “is not a hot spot by any means," but shootings are always bewildering. “These shootings are hard to really understand and comprehend,” Cardenas said.